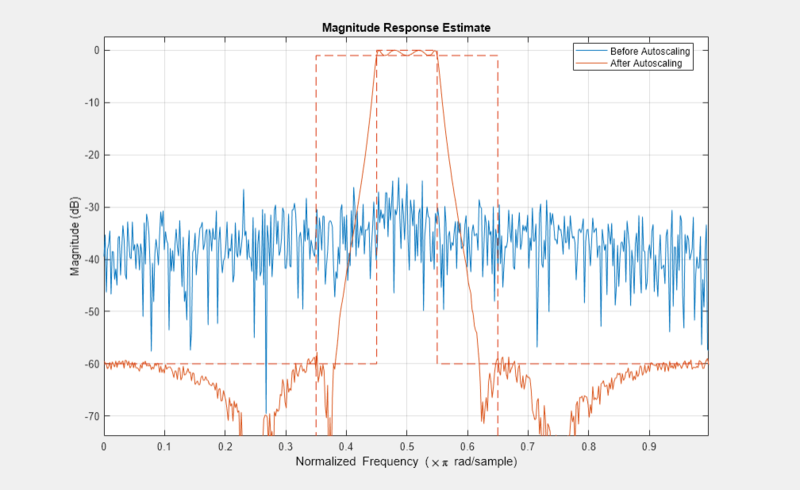 autoscale(hd,x) provides dynamic range scaling for each node of the filter hd. This method runs signal x through hd in floating-point to simulate filtering. autoscale uses the maximum and minimum data obtained from that simulation at each filter node to set fraction lengths to cover the simulation full range and maximize the precision. Word lengths are not changed during autoscaling. hnew = autoscale(hd,x) If you request an output, autoscale returns a new filter with the scaled fraction lengths. The original filter is not changed. For an introductory example of the automatic scale process, see Floating-Point to Fixed-Point Conversion of IIR Filters. rng(4); x = rand(100,10); % Training input data.